The City of Jeffersonville and Jeffersonville City Pride are teaming up to host a litter Clean Up Day. On April 7, from 10 a.m. – 12 p.m., we are asking you to join us in a community service project. 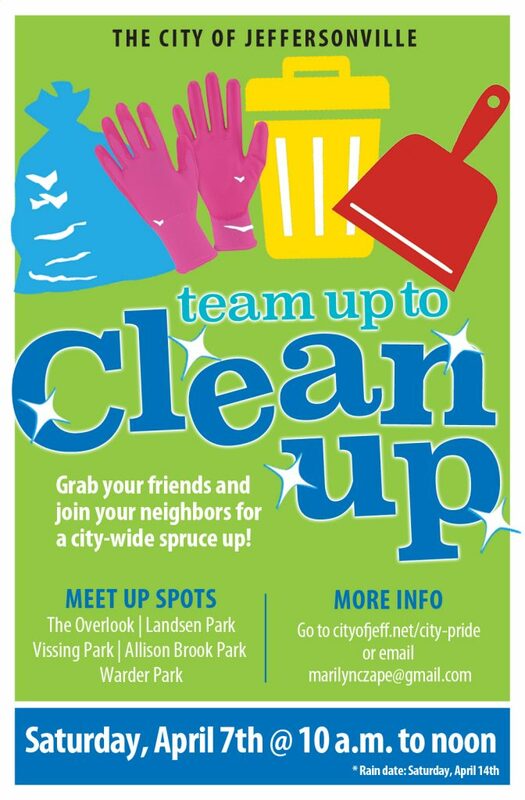 Organized pick-ups will be in five city parks – Lansden, Warder, Vissing, Overlook or Allison Brook. Volunteers can participate as a group or as individuals. You can also use this day to organize a pick-up in your neighborhood. The City will supply gloves and bags. Just let us know how much supplies and what location you will be at a few days before the event. We encourage groups to make a couple of anti-litter signs to carry so other citizens know what we are doing. If your group has access to an outside display sign, it would be great if you could display the information about the kick-off plus a saying such as ” Every Litter Bit Hurts” or “Clean Blocks Build Pride” or something appropriate to your individual group, about a week before the pick-up.